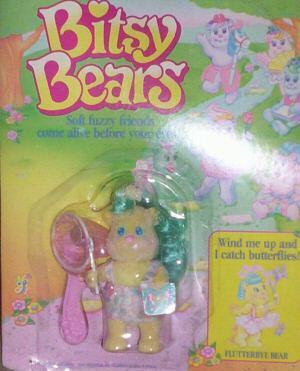 "Soft fuzzy friends come alive before your eyes!" This page is brand new and is missing A LOT of information. 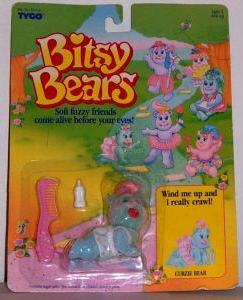 Most of my information so far has come from eBay and Bitsy Bears are scarce there. If you have any information on the names of sets or pictures of any MOC/MIC/MIB let me know and I will include it here. None of the toys shown here are available for sale. Thank you! :) I can be contacted through E-mail. 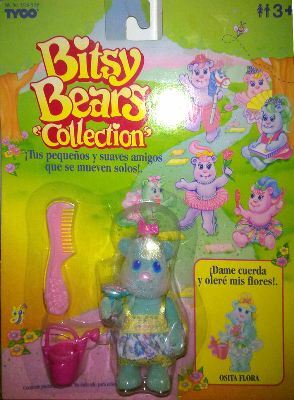 These sets were available in several countries, so sometimes the names will be in different languages on the packaging. 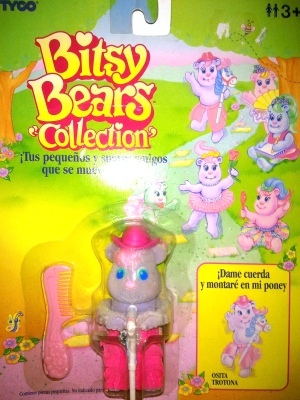 Also, in some places they were known as the "Bitsy Bear Collection." 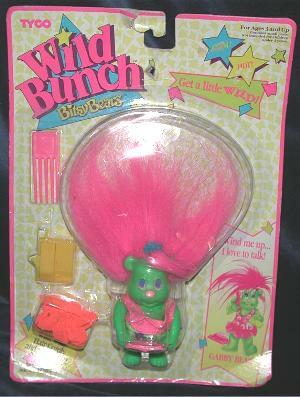 --"Wind me up and I really dance!" 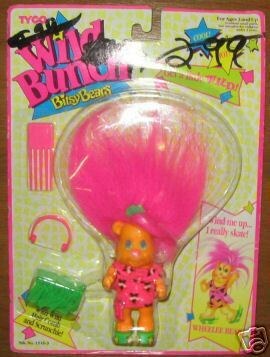 --"Wind me up I brush my hair!" 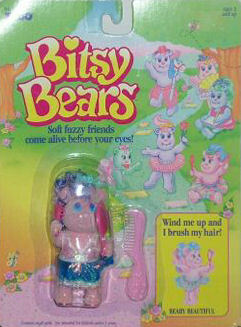 --"Wind me up and I sniff my flowers!" --"Wind me up and I ride my pony!" 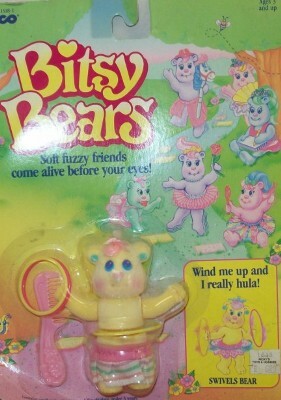 --"Wind me up and I really crawl!" --"Wind me up and I really write!" 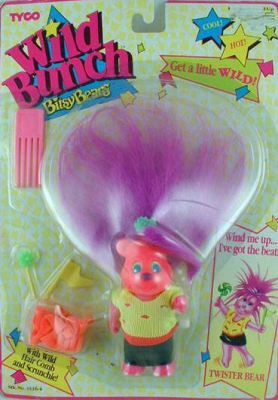 --"Wind me up and I catch butterflies!" 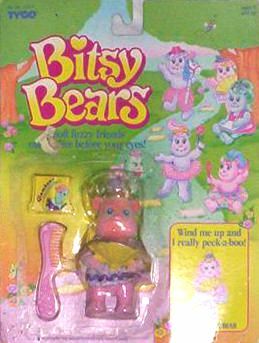 --"Wind me up and I really peek-a-boo!" 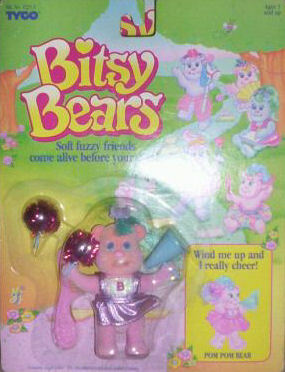 --"Wind me up and I really cheer!" 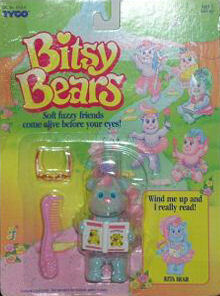 --"Wind me up and I really read!" --"Wind me up and I really skate!" 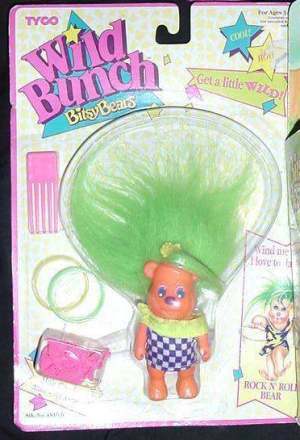 --"Wind me up and I really hula!" --"Wind me up and I eat my ice cream!" 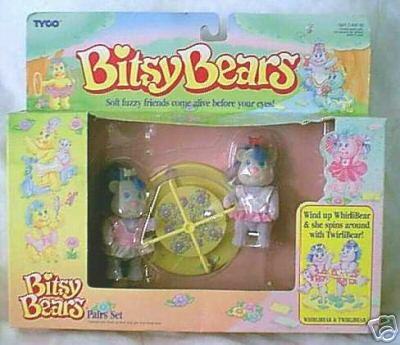 --"Wind up Teeterbear and she seesaws with Totterbear!" 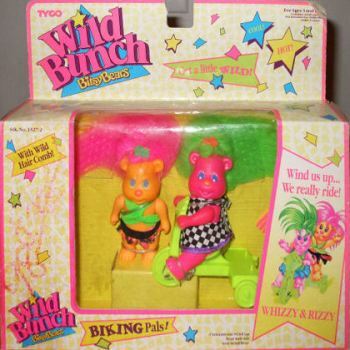 --"Wind up Whirlibear & she spins around with Twirlibear!" 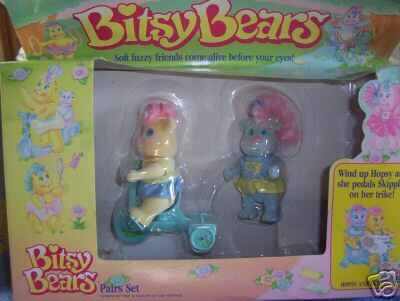 --"Wind up Hopsy and she pedals Skipples on her Trike!" 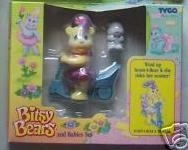 --"Wind up Lullabye Bear & she rocks her cradle!" 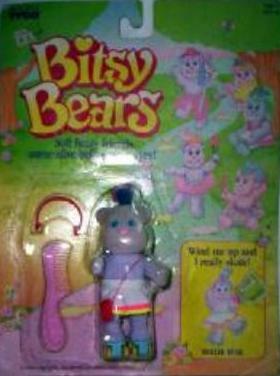 --"Wind up Whoopsee Bear & she pushes her swing!" 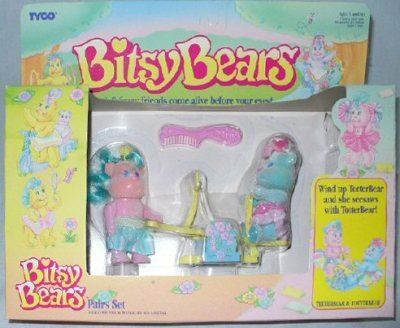 --"Wind up Scoot-A-Bear and she rides her scooter!" --"Wind up Pawleena and she pushes her stroller!" 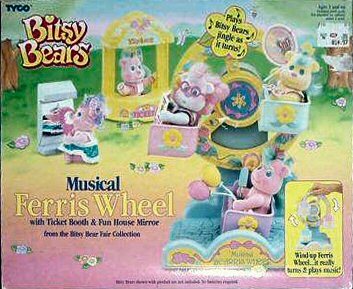 Musical Ferris Wheel --With Ticket Booth & Fun House Mirror from the Bitsy Bear Fair Collection. 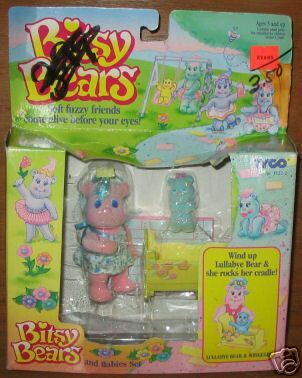 --"Wind up Ferris Wheel... it really turns & plays music!" 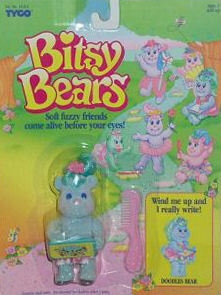 --"Plays Bitsy Bears jing as it turns!" 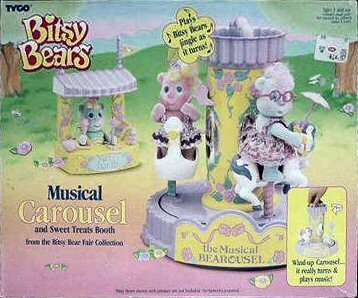 Musical Carousel --And Sweet Treats Booth from the Bitsy Bear Fair Collection. 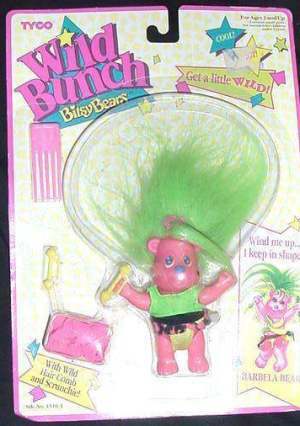 --"Wind up Carousel... it really turns and plays music!" 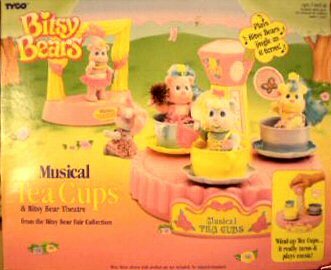 Musical Tea Cups --& Bitsy Bear Theatre from the Bitsy Bear Fair Collection. --"Wind up Tea Cups... it really turns and plays music!" 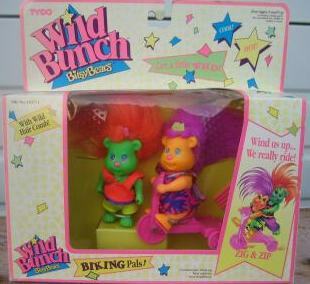 --"With Wild Hair Comb and Scrunchie!" This site, its design, and all content within are Copyright �2006-2010 by Zuse unless stated otherwise. All rights reserved. 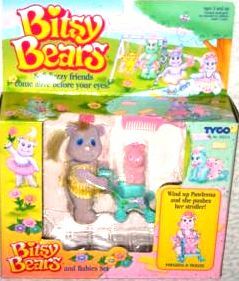 Bitsy Bears name and logo are registered trademark of Tyco. 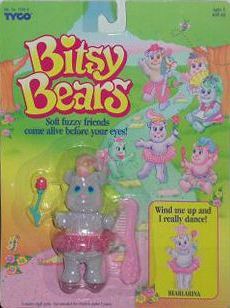 This guide to the Bitsy Bears is intended only as a reference for collectors and is in no way endorsed by or affiliated with Tyco. All names, logos, and trademarks are the property of their respective owners. 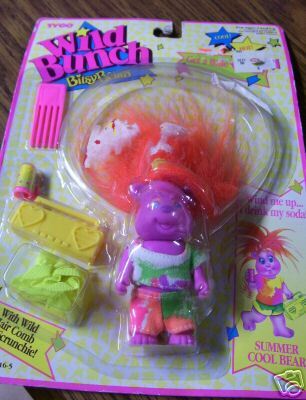 I do not own any of these items. 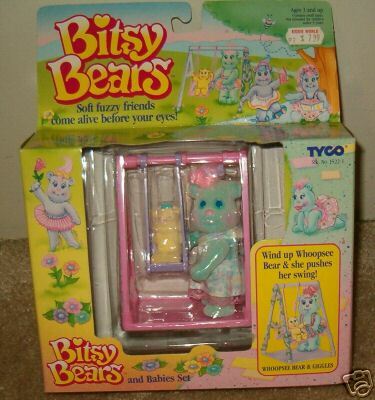 The pictures came from eBay and are copyright to their respective owners.